What are wisdom teeth? Technically they are your third molars. As a baby ages to adolescence, teeth come and go. Incisors, canines premolars, molars, and finally the wisdom teeth. Some people are born without wisdom teeth. Out of the people that do have wisdom teeth, some will have little trouble with them and will hardly notice they are there, while other patients may experience pain and even infection. People typically notice their wisdom teeth growing in between the ages of 17 and 21. In some cases wisdom teeth do not fully erupt and will stay partially buried within the gums. Other people may never see their wisdom teeth. 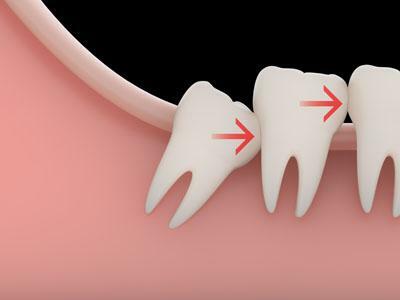 If the wisdom teeth fail to erupt, they remain under the bone and tissue. Wisdom teeth that stay buried are called “impacted” and can sometimes require extraction. Some researchers speculate that early in human history wisdom teeth may have served as replacements for other molars when they became worn or rotten. However, nowadays, our diets and advances in dental care ensure that our teeth stay strong and last longer than our ancestors’ teeth. Additionally, through evolution, our jaws have become smaller, leaving little space for these extra molars. In fact, today wisdom teeth have no discernible function. They are not needed for chewing and often cause more problems than they are worth. Erupted wisdom teeth can be hard to keep clean, and keeping them can lead to several problems such as pain, gum disease, and tooth decay, which can result in infection. Impacted wisdom teeth come with a whole other set of problems including discomfort and cysts. If left untreated, cysts can lead to loss of bone and nerve damage. It is important to speak with your dentist about the best option for your wisdom teeth. In most cases they will recommend extraction. Dentists prefer performing the extraction procedure on patients in their late teens or early 20s. If an adolescent has braces, it is common to wait until the braces have been removed before extracting their wisdom teeth. Removal of wisdom teeth is best done before the bones of the patient’s jaw harden. Once the jaw solidifies, the removal of wisdom teeth involves higher risks of permanent nerve damage. As with any dental issue or concern, constant vigilance and early detection can save you a lot of discomfort and often save you form more serious consequences. Make sure you visit your dentist regularly, and if you start to experience any unexplainable pain in your teeth or jaw, speak with your dentist immediately.